Do you believe 27 hours of prayer and worship can change history? On Sunday, September 13, at 7:00 P.M. Christians will be gathering on the West Lawn of the United States Capitol for 27 hours of intercession and worship. Believers will be crying out for God to intervene in the national health care debate and ensure that taxpayer funds and not used to pay for abortions. This marks the first full week that Congress is in session after the August recess. If public monies are used to pay for abortions, it would add at least 25 years in our struggle to end abortion in America because abortion would then become an entitlement. It would also place our nation on a collision course with God’s judgment because every citizen will be subsidizing the crushing of human rights and social justice by paying for abortions. In other words, Christians would now be responsible for the shedding of innocent blood. The future of our nation is at stake. It is time for the church to rise up and be a prophetic witness and powerful voice for justice. We do not have to be helpless bystanders as events unfold on the world stage. But through intercession and worship, we can help change and shape history. These 27 hours can change the future of our nation forever and help ignite a sovereign move of God that will bring spiritual awakening and cultural reformation to America. As we gather on the lawn of the Capitol in repentance and passion we believe that the Holy Spirit will move in a powerful way. We have already seen God do amazing things as Christians gathered on Capitol Hill at the end of July to pray for a delay on the Health Care vote until after the August recess. Against all odds, God answered that prayer in a dramatic way and the vote was delayed. The Holy Spirit is now calling us back to prayer. We prayerfully ask you to consider coming to Washington, D.C. to be a part of this historic 27 hours. It is imperative that the Church step of their apathy and indifference and into the purposes of God for this hour. 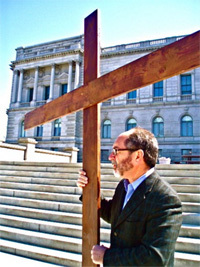 Prayer and worship begins at 7:00 P.M on the west lawn of the Capitol and continues until Monday at 10:00 P.M. Prayer and worship all day on the west lawn of the Capitol until 10:00 P.M.
We will gather to walk over and pray for the 100 members of the Senate. The Christian Defense Coalition, Bound for Life, The Fredericksburg Prayer Furnace, Generation Life, Survivors, Grace Church of Fredericksburg, Operation Rescue, Pro-Life Unity, The National Black Pro-Life Union, Faith and Action, The Network of Politically Active Christians, and the Family Research Council. Make sure to take part if you’re in the D.C. area!